Are you looking to beat the dreaded Austin summer heat and make your home cooler and more energy efficient? Then solar window screens from the Austin Shade Team experts are probably right for you. But what are solar window screens? Solar window screens are shade screens that cover your entire window. They install as one shade screen per window. Solar window screens provide either 80 percent shade or 90 percent shade. We like to use the 90 percent shade fabric for all windows that receive four or more hours of sun per day, generally your west-facing windows. For the rest of the home, we suggest using the 80 percent fabric. When we see the home, we will use our compass to determine which windows would benefit the most the 90 percent shade fabric and we will make that recommendation to you. Our solar window screens come in five color options: Black, chocolate, beige, stucco, or grey. We also have five different framing color options for you to choose from. Typically, you would want to match the solar screen frame with the color of your solar screen windows. But, in some cases it does look aesthetically pleasing to outline your solar screens with a different color of frame. Don’t worry, we are very good at picking colors for each home, so we’re here to help with this process. Solar Window screens will replace the need for your current bug or insect screens, so we will remove your current screens upon the installation of our custom solar window screens. Solar windows screens do not need to be installed on all your windows, just the windows that get sun. However, for the best look or if you would like continuity, all windows on a particular side of the home can and should be covered with solar window screens. Especially when it comes to the front of your home, you will not want to leave any windows uncovered, as it will look incomplete. 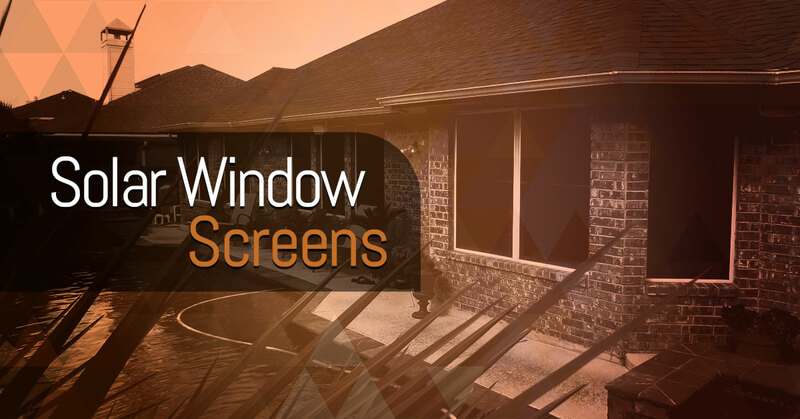 Still have questions about solar window screens in Austin? Learn more about our service areas. Ready to get started? We’re here to help. Contact the solar shade specialists at the Austin Shade Team today for more information.